March 21, 2019 -- The next time you order the catch of the day, beware: There’s a good chance you won’t get what your pay for, according to a recent study on seafood fraud. The conservation group Oceana found that 21% of the fish that researchers sampled from across the United States was not what it was labeled -- instead it was less desirable or cheaper fish. Popular and pricey fish like sea bass and snapper had the highest levels of mislabeling -- 55% for sea bass and 42% for snapper. “If the price is too good to be true, you might want to choose something else,” says Kimberly Warner, a senior scientist at Oceana and one of the report’s authors. Seafood was more frequently mislabeled in restaurants (26%) and at smaller markets (24%) than in large grocery stores (12%). Warner says 90% of the seafood eaten in the United States is imported, and less than 1% is inspected by the government specifically for fraud. “The government needs more oversite and traceability of our seafood,” she says. Oceana used DNA to test 400 samples of seafood from more than 250 retail outlets across the United States for the study, released March 7. Last year, the New York Attorney General’s Office that found more than 1 in 4 samples of seafood bought at supermarket chains in the state were mislabeled. “Research shows that seafood is mislabeled at all steps of the supply chain, from the time of catching to the import level, processing level, and grocer, retail, and restaurant level,” Warner says. 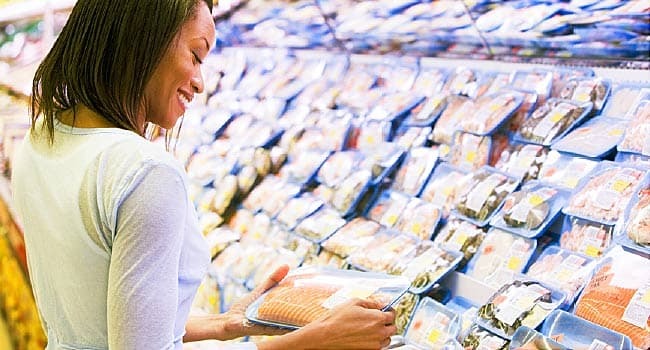 People are more likely to encounter mislabeled seafood in restaurants, either because a restaurant is unaware that it has purchased mislabeled fish, misidentifies a fish, or has purposely mislabeled it, Warner says. Not knowing what kind of fish is on your plate can be dangerous to those who are allergic or more sensitive to certain types of seafood. Warner says “wild” caught fish -- purchased at a premium -- are often substituted with farm-raised fish, which have higher levels of antibiotics and chemicals. The study also found that some fish was not sustainably caught, as advertised, and so-called locally sourced fish was from another country. “Seafood is the last wild-caught food we eat. It tends to be pricey. If you’re going to a restaurant and paying top dollar, you want to be getting what you pay for,” she says. Gavin Gibbons, a spokesman for the National Fisheries Institute, says his organization's Better Seafood Board works with the restaurant industry to make sure fish are labeled correctly. “There’s a difference between regulating enough and enforcing enough,” he said. “We have the regulations … we need the FDA to determine where the fraud comes from and go after scofflaws” the way the New York Attorney General’s Office is doing. The FDA’s most recent report on mislabeled seafood, from 2013, found that seafood labels were accurate 85% of the time. The agency used DNA testing on fish from 14 states. “It shouldn’t be up to the consumer to test everything they want to buy,” Warner says. The National Oceanic and Atmospheric Administration contracts with seafood processors and distributors to help monitor safety regulations and to evaluate product quality and grading. In 2018, NOAA created the Seafood Import Monitoring Program to track 13 species at high risk of being fraudulently sold or sourced illegally. The Oceana study did not test those species for the recent study; instead, it focused on other species than high-risk. NOAA’s National Seafood Inspection Laboratory earlier this month rolled out a web-based screening tool that it says will make flagging mislabeled fish easier. The lab also offers what it calls a “rapid detection method” to determine the species of a sample of fish. John Spink, director of the Food Fraud Initiative at Michigan State University, says he’s found that the seafood industry takes fish fraud very seriously. That’s because if there is a problem -- say, someone gets sick from eating mislabeled fish -- people might stop buying seafood, and “everybody suffers” in the industry. “The industry works together, with the private sector forcing standards on the private sector,” he says. The best way for consumers to protect themselves against fish fraud is to eat at reputable restaurants and shop at reputable grocers, Spink says. “I’m careful where I buy,” he says. Matt Olson, fresh program manager at the Independent Natural Food Retailers Association, says his organization works with distributors who can document a fish’s origin. Honest labeling is essential because it can be hard to tell if something labeled “wild,” like salmon, is actually farm-raised, he says. “It gets very complicated,” says Olson, who represents more than 200 independently owned grocery stores across the country. “Just with salmon alone, finding out what kind and where it comes from. There are viable farm-raised options, but they need to be labeled,” he says, noting that many species look similar. King mackerel, a fish on the FDA’s “Do Not Eat” list for sensitive groups due to high mercury, was sold as grouper in a grocery store in South Florida. Tilefish, also on the “Do Not Eat” list due to high mercury, was sold as halibut and red snapper in a small market in New York City. Overfished Atlantic cod was sold as orange roughy, another unsustainable choice, in Kansas City. Another imperiled fish, Gulf grouper, was sold as more sustainable black grouper in Denver. Every sushi sample in Austin, TX, was mislabeled. When ordering fish in a restaurant, ask where the fish came from and how it was harvested. If the server doesn’t know, wait for him to ask the chef. Look at the price of the fish. Don’t purchase an expensive fish like sea bass or red snapper if the price seems too good to be true. At a restaurant, ask if fish is sourced from the Better Seafood Board. This means the restaurant is following best practices, just like the Better Business Bureau. If you go to a sushi restaurant and find white tuna on the menu, take your business elsewhere. There is no such fish as white tuna. Instead, it is often escolar, which can cause intestinal issues. If you are committed to buying sustainable fish, take the time to learn what fish are in season in your area. Buy fish from a reputable grocer or restaurant. Kimberly Warner, senior scientist, Oceana, Washington, D.C.
Gavin Gibbons, spokesman, National Fisheries Institute, McLean, VA.
John Spink, director, Food Fraud Initiative, Michigan State University, East Lansing. Matt Olson, fresh program manager, Independent Natural Foods Retailers Association, St. Paul, MN.